It was mentioned to me that I should update this blog to reflect the fact that I have finally finished my PhD! It only took me 6 years or so, but to be fair I also got married, had twins, and moved to Hawaii in the middle of all of that. So overall, not too shabby of a timeline given those variables. If you’re looking to get a PhD or in the process of attaining one and you’d like to chat or commiserate, feel free to hit me up on Twitter or in the comments here. If you’re interested in video games and research in that domain, I’ll be posting results of my study for my dissertation in the days to come! These are some notes I put together for my team last year. They are based off of a few books I was reading at the time and when I can remember those, I’ll post them for reference. We never made use of these due to reasons other than want and need, but others made find them useful. These are just notes. Feel free to fill in any gaps as needed or ask questions if you have any. An experience strategy is a guide for verticals / projects to be referred back to and updated as the vertical and/or project matures. It is a way to maintain focus on the end goal, providing the user with an experience, and is to be shared with and used by everyone on the team. For our purposes, they would likely live in confluences and our bullets would be numbered so we can refer to a specific portion of it when needed. 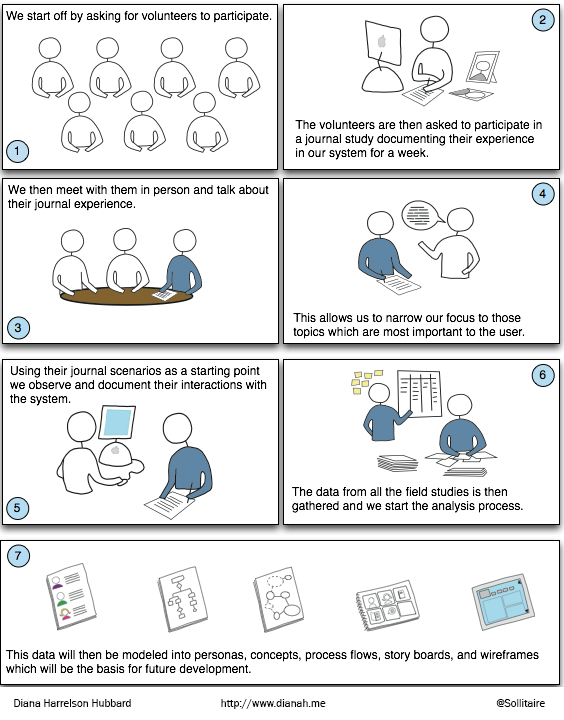 Personas and journey maps as well as other UX artifacts (research before release / usability tests after the fact) would be parts of the experience strategy. A strong plan will guide decisions about how the business executes, maintains, and manages experiences to create value for the customers and the business. These should be invested in and managed as well as cultivated and nurtured. 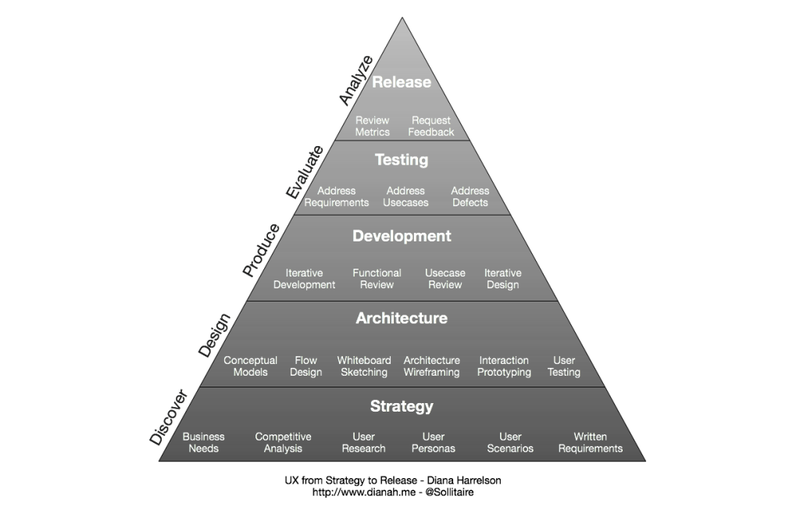 A strong experience strategy not only makes it clear what to do, but also what NOT to do. An expression of the experience you hope customers will have. A statement. What do people want to accomplish? How does this activity fit into their lives? How can we help deliver on those desires? Take all previous information, build on it, then start over if needed. Strategy should bring clarity and should act as a sign post to show the company where ewe are going and what we need to do to get there. Consider making it visual when possible. Leveling Information – so we all start out with the same definitions. Perception is preceded by sensation and followed by cognition if bottom up, if bottom down – then knowledge influences everything (Gestalt). Ability – consider memory, it includes sensory (get attention), working and encoding (requires heavy attention), long-term and retention (storage). Recall falls off dramatically after 1 day – this is an issue for users who do not / would not / don’t need to / shouldn’t have to – interact with us or a particular tool / experience on a daily basis. Always something to consider. Reduce memory load / ability requirement whenever possible. Flow – form follows function. Affordance means there is no need to learn. Avoid multi-usability (modes). Theories should be as simple as possible, but no simpler. I think one of the things people fail to realize about the possibility of this Apple backdoor is that it not only has implications for us as Americans, but also for people all over the world. Consider what doing this would mean for people who live their daily lives in danger when the only protection afforded to them or their loved ones may be the fact that their privacy is secure and their data encrypted. Consider what it may mean for journalists or whistle blowers. Many people all over the world only access the Internet through mobile devices. It’s all they can afford. They may even make their living doing so. What if that was taken away because it was no longer considered secure? Consider everything you have done with your devices knowing they are secure and what may change in your life if at some point it no longer was. It’s World Anthropology Day. I challenge everyone to look around the world a little differently today to see if they can empathize with people who live in situations completely different from their own. I challenge you to consider what your life would be like if your privacy no longer existed and you had to live in fear – this is reality for so many. I get a few inquiries each semester from students looking for information on how to get into user experience design, especially those with an anthropology background. I generally try to respond to each of these separately as they each have their own perspective and needs, however, this semester I am trying to get my dissertation defended on top of my every day job as a UXD (which is getting more complicated by the minute). So, rather than leave these unanswered, I am providing a public response here that includes the most common things I share. If you have comments or questions, please leave them! It will be easier for me to respond to those here than individual emails and you may help someone else who has a similar inquiry. Thank you for reaching out to me. Let me start out by saying that having a background in anthropology will lend itself greatly to UX design, however, it is only one part. My suggestion is to consider opportunities where you will be asked to learn to program or script (even just HTML/CSS) and have real users use what you create. This is not necessarily where your career path as a UXD will take you, but creating something, having users use it, and then having to “fix” it to make it better for them, will provide you with insight that no degree program will ever do. As for internships, consider looking into the agency world. What I mean by that is marketing/creative agencies that do campaigns for other companies. Not that you want to go into marketing, I prefer the high tech/application world myself, but it allows you to see how UX is applied to multiple groups of people and projects in a short amount of time. A lot of times you can find UXD or IA (information architecture) opportunities – both of which would be beneficial to you. And I suggest taking a look at the UX Slack channel that has UXers from all over the world lending their perspectives to the field (and it may lead to internship opportunities). There is a lot that could be added to this, however, I feel it is a great place for people to start. I definitely recommend everyone going into user experience design have some sort of programming or scripting background where people have had to use what you create. My biggest failure as a developer led me to becoming a UXD and in my particular field I use skills I learned as a systems administrator/developer all the time. Not that I do those things anymore, but my past experiences and my understanding of those things definitely help inform me how to make those things easier for others to do. And really, that’s the best part of being an anthropologist and a UXD – being able to use your own experiences to inform your designs. That is, after all, what participant observation is all about! 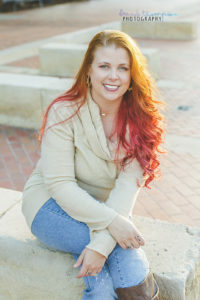 To learn more about my professional experience, please visit my design and ethnography site. p.s. This may be edited and updated as I have time. If you have questions/comments – please post them! While you may have never asked yourself this question, you may have had friends or family that passed on and wondered what happens with their account now as it stands in tribute to their memory. Facebook has recently released a feature that allows you to bequeath access to certain parts of your Facebook account (pinning a post, updating profile picture and cover photo) to a trusted friend or family member and the access is only granted to them after you have passed. You can access this option under Settings > Security > Legacy Contact. Would you use this? Why or why not? 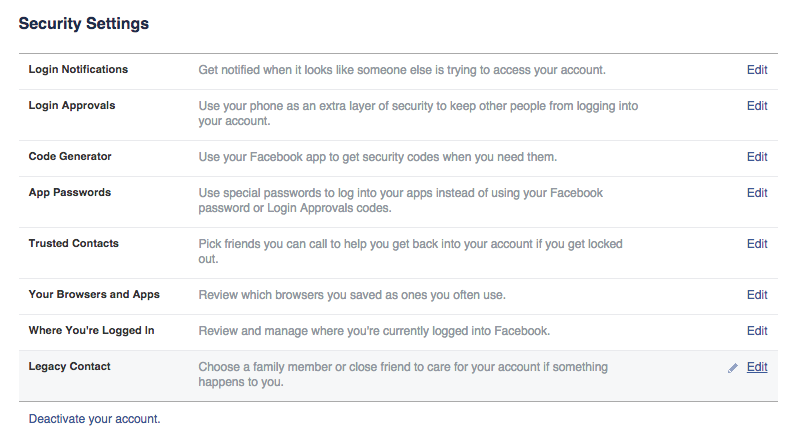 Though it does grant someone else access to your account, it is somewhat limited and you can decide whether or not you want to allow your benefactor the ability to download your Facebook content. Learn more about this new feature here. 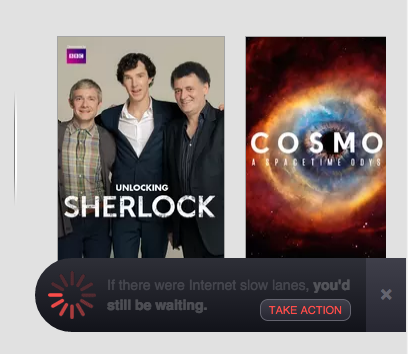 Or, at least several major sites wanted you to know what it might feel like if it were to slow down permanently due to what they say may result in Internet “fast lanes” where companies would be able to purchase the ability to have their sites served faster than others (ala, the Comcast/Netflix agreement made earlier this year). This would potentially disrupt what we’ve all come to know and love as the digital economy of the Internet. Meaning, if another movie / tv streaming content provider tried to enter the market today without the ability to sign a similar agreement (if only because they were new) they would be unable to even attempt to compete and thus their service would fail before users ever had a chance to try something that may be better or more innovative than the current big kid on the block. While even without net neutrality, enforcing payments like this (rather than the two companies voluntarily entering an agreement) would be legally hard to do today due to current antitrust laws, that doesn’t mean the little guy still wouldn’t find itself in a precarious situation – but perhaps that’s as it should be given the ups and downs of the digital economy. What is the purpose behind this? Well, the telecom infrastructure in America is largely owned and maintained by private businesses including but not limited to Level 3 Communications, TeliaSonera International Carrier, CenturyLink, Vodafone, Verizon, Sprint, and AT&T. You might recognize the last three as companies from which you purchase your Internet connectivity. It is in their interest to make a profit. But, from what they tell us, it is hard to do that while maintaining and innovating on the infrastructure at the same time. To my understanding (which could be wrong, I am not a networking expert – feel free to correct me), companies are fighting against the need to use a standard which treats all data the same regardless of what is being carried (i.e. TCP/IP). As an alternative, each company would able to create their own innovations that would help their own networks move data along without that technology necessarily being shared with everyone else. Without chiming in on one side of the debate or the other, this could be very good for consumers in the long run as competition in this area would drive innovation further and further. The fear is that while competition has somewhat driven the cost to connect down on the consumer side, these companies must find another way to make profits and are looking toward the providers of digital goods as a potential revenue option. To that end, many see these infrastructure companies’ waves against net neutrality as an attempt to charge content providers money to ensure their data reaches their customers as fast as possible. This idea is comparable to a tollway company claiming their roads need maintenance and thus charging stores along the tollway, that have no other way to access them, extra fares to make sure consumers can access the offramps to those stores without delay, while also collecting money from the consumers themselves in order for them to gain access to the tollway in the first place. However, as I said above, this would be difficult to do given the antitrust laws currently in place. I hope I’ve been able to some what enlighten people as to what the big deal is and I hope I have shed some light on the topic that is not as black and white as most of us have been lead to believe. The lesson to be learned, as with most things on the Internet, is issues such as these aren’t always necessarily as they first appear and a little research goes a long way. This is especially so where government and technology intertwine. 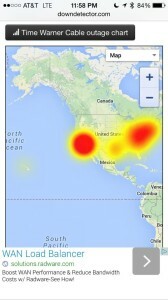 People across the US are waking up this morning to the fact that Time Warner Cable is down. 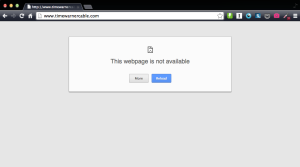 Apparently it’s not just their network that is down either. 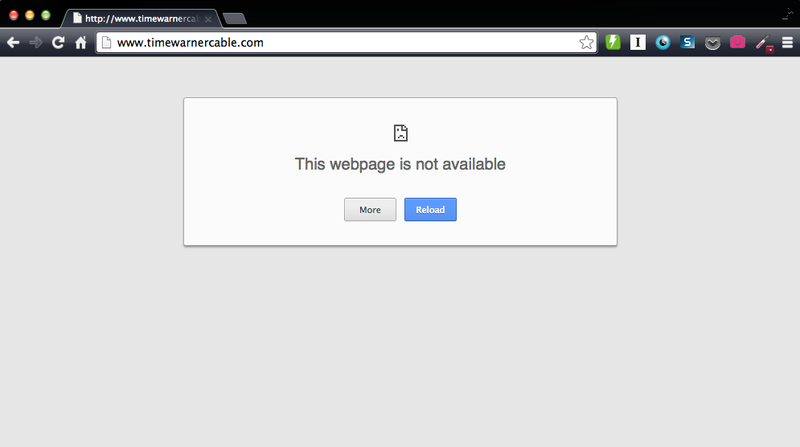 Their own website is also down and there are reports that no one is answering calls into Time Warner either. From the spike in reports shown above, it looks like the majority started happening just before midnight HST or 6am EST. Timing is everything of course. 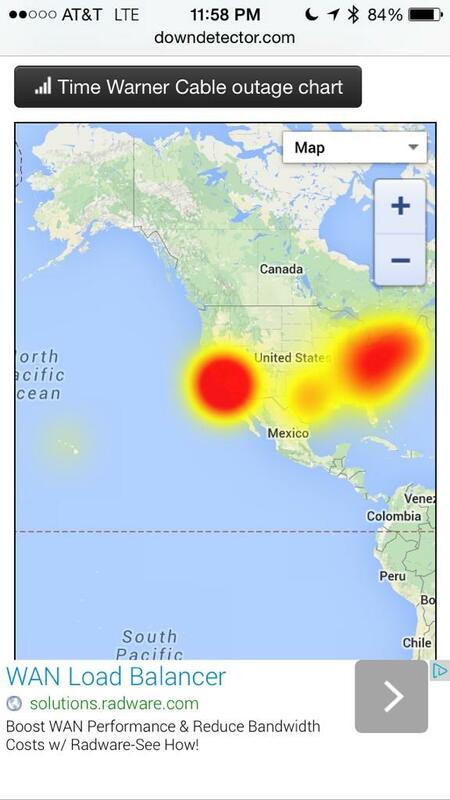 I just cancelled my cable TV today and am now apart of a massive Internet outage. I’m sorry?